Displaced Tropheus in Lake Tanganyika. Repeated observations of displaced cichlids in habitat have been reported by several collectors in the ornamental fish trade (pers. comm.). During surveys in 2007/2008, displaced cichlids or hybrids were found (predominantly Tropheus, the commonmost being T. sp. “Kaiser”) at numerous localities (20) along the Tanzanian shores of the lake. The largest impact is suggested to derive from accidental releases of fish from portable storage cages kept in the lake. But also, sick or weak fish, if dumped overboard, could contribute to the fish displacement. The combined observations show that at most well-known collecting sites along the Tanzanian shore of the lake, individuals of many of the most prized Tropheus variants could be encountered (even variants originating from the Congo and Zambia). Figs. 1-3. Three different forms of hybrid Tropheus. The problem seems to be most common at pick-up and transshipment points, where fish are kept in submerged cages in wait for further transportation by road/air or for transit transportation to such a pick-up point. At three localities, the occurrence of alien Tropheus variants was found to be significant, namely at Shashete Bay, Cape Mpimbwe (transshipment point, Congo fish), Nanga Bay (sheltered bay), and Mlowa Point, Kipili (near pick-up point). At the latter locality, the alien Tropheus variants almost outnumbered the local congeneric. Allegedly, two weeks earlier a larger number of Tropheus from Zambian waters had escaped from a cage in the adjacent Kikopyo Bay near Kipili village. Though displaced cichlids could be found at many localities, it is expected that pick-up points at Kasanga, Kipili, Udachi/Kabwe, and Kigoma are the most affected areas in the Tanzanian part of the lake. Similar problems have been reported from Zambia (see below). The northern side of Udachi Point was used by collectors as a temporary camp site, where fish often were kept in storage cages in the lake. Observations at Udachi of several alien fishes from the Congo were made in 2007 (genera Tropheus and Ophthalmotilapia). However, in 2012, no displaced fish were observed in the locality. The previously observed displaced individuals could have had time to spread over a larger area or been suppressed to deeper water (common for weak or old individuals). They could also have perished due to difficulties in establishing territory in the new environment, followed by intense food competition or fallen victim to predators. 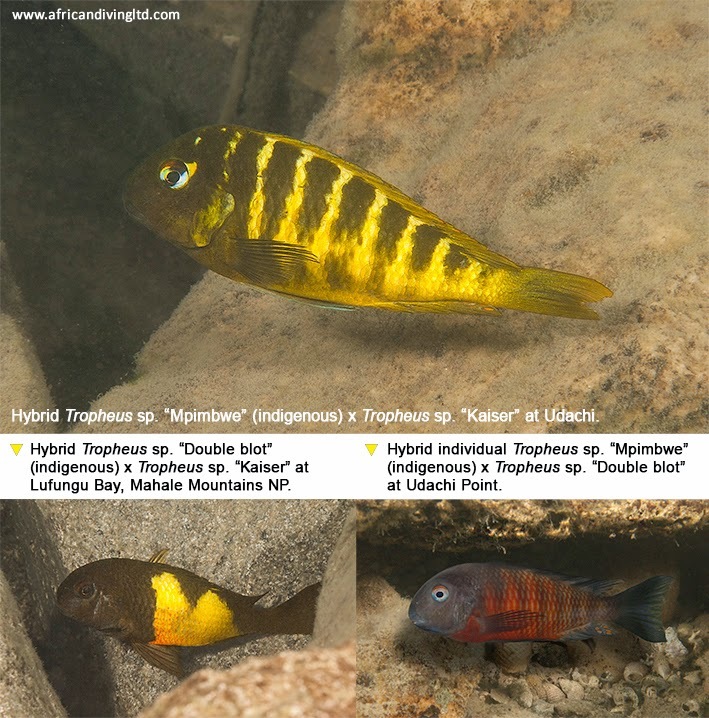 Two Tropheus hybrids were however found at Udachi in 2012 (see photos), an indication of non-native fishes previously being present in the area. Fig. 4. 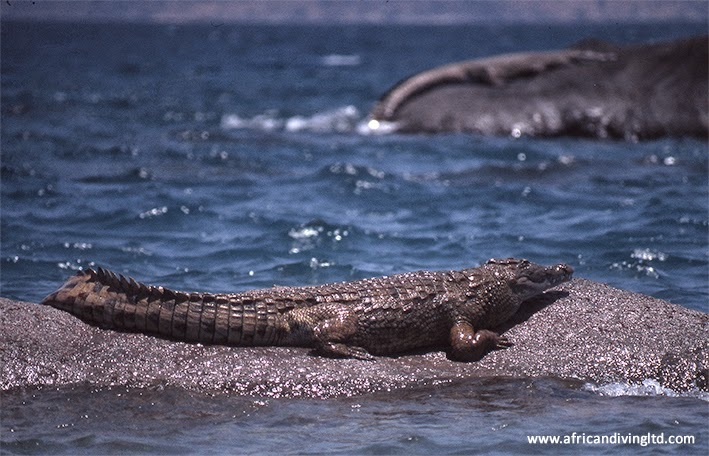 Crocodiles sunbathing on rocks near Udachi Point. Cape Mpimbwe in the distance. Tanganyika fisheries basically operate under an open access regime. This is clearly untenable and will lead to overexploitation of the valuable food source (FAO 1997: 52; Mölsä et al. 1999: 11). Also, the ornamental fishery needs to be regulated, and the parties involved should be informed about the lake’s unique fish fauna. Freelance collectors for the ornamental fish trade, selling fish at the lake to the highest bidder, are reported to be in operation in Tanzania, Congo and Zambia (at least as of 2007-2012). Lack of permanent stations at the lake and shortage of proper equipment (such as wire-meshed storage cages) may be a leading factor for the displacement of cichlids. Collected fish kept in cages at pick-up points along the shore are likely to escape if the net is torn by utters, crabs, larger predatory fish, and even by wear caused by waves. The ornamental fish trade is self-remediating to some extent by collectors’ common tendency to catch odd looking individuals, as “new fish” are in demand from their clients. But a message to all active collectors would be an urging to ensure secure storage cages (or abandon the use of such altogether for fish originating elsewhere), and to remove alien individuals and hybrids from the habitat whenever observed. With awareness and joint forces the problem could diminish or even cease to exist. If disregarded, it could eventually lead to disruptions in the lake’s native fish fauna. Hybridization among naturally sympatric species (non-displaced) in Lake Tanganyika seems uncommon; alternatively, hybridization is difficult to detect. The situation in Lake Malawi is said to be similar: “There have been only a handful of documented hybridizations in Lake Malawi” (Stauffer and Kellogg 1996: 26). But “recent work shows that hybridization and introgression are more frequent than imagined by earlier evolutionists...” (Coyne and Orr 2004: 41); and recently Koblmüller et al. (2007) showed on a net-like phylogeny for shell-breeding Lamprologini, instead of the normally tree- or bushlike, as an indication of hybridization. So, even though hybridization unlikely is a frequent phenomenon, it has potentially influenced evolution. The non-hybridization may indicate ecological and phenotypical balance among sympatric species. Thus, dislocation of species, and introduction of alien, invasive species, may likely disturb the balance. One of the results may be hybridization. Deliberate displacement of species made by humans are usually referred to as ’translocation’. The translocation of Cynotilapia afra from Likoma Island to Thumbi West Island (both locations in Lake Malawi) resulted in intergeneric hybridization with the native population of Maylandia zebra; same result with the translocation of M. callainos from Nkhata Bay area to the same island (Stauffer and Kellogg 1996: 26; Barlow 2000: 236). Additional species reported being translocated to Thumbi West Island are e. g. Tropheops sp. “Mbenji blue”, Melanochromis loriae, Pseudotropheus perileucos, P. johannii, Labidochromis freibergi, L. gigas, L. joanjohnsonae, L. strigatus (Lewis et al. 1986: 63-67; Konings 2007b: 75); Maylandia aurora, T. sp. “Membe” and P. socolofi (Konings 2007a: 176, 197, 204). In 1998 about 300 individuals of Tropheus were collected from several sites in the southern part of Lake Tanganyika, intentioned to be exported for the tropical fish trade (Salzburger et al. 2006). But export permit was not granted and the fishes were released back into the lake; however, not to their domestic locations but dumped in a small harbour bay in Mpulungu; this was followed soon thereafter by a study on the assortative reproduction patterns among Tropheus (Salzburger et al. 2006). Based on colouration, five different variants could be identified: a light-olive variant conforming to the indigenous population, identified as or resembling the Mbita type; a dark-olive variant conforming to populations found along the Zambian east coast [most likely from Isanga, also known as Kalambo type]; an orange type, Ilangi; a red type, Chilanga; a stripe-red type, Chimba (Salzburger et al. 2006). The origins of the latter three were “assigned to the shoreline northwest of the Lufubu estuary, between Cape Inangu and Moliro”. A neighbouring population, situated about 50 metres away from the composite population, was included in the study as a reference group. This group plus Mbita and Kalambo were grouped together with mtDNA sequences into the same lineage (descent), while the other three (Ilangi, Chilanga, Chimba) clustered together in a different lineage. Tropheus samples were analysed based on colouration and DNA*. Sampling of both composite and reference population was done in 1999, 2000, 2001, and eventually the result showed that 68% of the offspring seemed to have originated from within-morph matings, and only 1,6% (3 juveniles out of 180) came from mating between the two different lineages (olive/reddish). Most of the hybrids produced were between Mbita and Kalambo. The interpretation of the result was in line with assortative matings, and signals such as visible, chemical, acoustic were suggested to be decisive, especially signals relating to colour-assortative matings. The study was followed up in 2010 (Egger et al. 2012). Samplings of both the composite and reference population were done, as well as a re-evaluation of the result from the 2006 study. The result was different this time, and showed that intermediate phenotypes (a mix of two or more colour variants) were present already in 2000 and increased dramatically in abundance between 2001 and 2010. In the neighbouring population, no intermediate phenotypes were identified from 1999 to 2001, but were present in 2010. For both the neighbouring and composite population sampled in 2001 and in 2010, only few individuals could be assigned to a particular colour variant with correct genetic corresponding, indicating a high frequency of hybridization between morphs. The result also showed that the hybrids and nonindigenous individuals from the composite population in the harbour bay had spread to the neighbouring population (intermediate colour morphs were found, Egger et al. 2012: 517); therefore, a hybridization event in general is unlikely geographically isolated, but may spread to other populations. The hybridization is speculated of being due to periodic algal blooms or increased sedimentation causing turbid conditions (Egger et al. 2012). But studies of Tropheus have shown that the frequency of inter-morph matings increases with increasing colour pattern similarities, i. e. similar looking Tropheus-variants more easily hybridize than differently looking variants (Egger et al. 2008). Therefore an alternative cause of increasing hybridization is the weakening of ideals; where just a single phenotype used to characterise the ideal are now several, of which may increasingly be accepted among individuals. Concludingly, it seems to be rather safe to say that displacement of species will eventually result in hybridization. * Analyses of DNA sequences of mitochondrial control region plus five microsatellite loci. Barlow, G. W. (2000) The cichlid fishes - Nature’s grand experiment in evolution. First paperback edition, printed in 2002. Basic Books, New York, NY, 335 pp. Coyne, J. A. and Orr, H. A. (2004) Speciation. Sinauer Associates, Inc. Sunderland, MA, 545pp. FAO (1997) Technical guidelines for responsible fisheries, 4, ‘Fisheries management’. FAO, Rome. Konings, A. (2007a) Malawi cichlids in their natural habitat. Fourth edition. Cichlid Press, El Paso, TX, 424 pp. Konings, A. (2007b) Die Buntbarsche der Insel Thumbi West. DCG-Informationen, 38 (4): 73-78. Deutsche Cichliden-Gesellschaft e. V.
Lewis, D. S. C., Reinthal, P. N. and Trendall, J. (1986) A guide to the fishes of Lake Malawi National Park. World Wildlife Fund, Gland, Switzerland. 71 pp. Mölsä, H., Reynolds, J. E., Coenen, E. J. and Lindqvist, O. V. (1999) Fisheries research towards resource management on Lake Tanganyika. Hydrobiologica, 407: 1-24.